I discovered Craftsy today! I think it was an ad in Facebook, for a lesson on how to paint pets, for €15. At that price, I thought it was worth a try. And I had heard of Craftsy through a customer of mine who is into knitting and crochet. I just didn't realise that they also did fine arts. I had done a good drawing of our cat many years ago, but I had never pursued it beyond that drawing. As he is not getting any younger, the urge to paint him has come back. And also our dog now. So I've watched the first part of the lesson, and I'm already diverging from the teacher's instructions. There is no way I could do a freehand drawing like that, even from a photograph. So I'm using a grid system, 2 cm on the original photo, 3 cm on the drawing. I have a good bit more to do, but I'm pleased with the likeness so far. And I've picked up some useful tips from the teacher. Some of the students on the forum are complaining that the teacher doesn't explain enough about how to draw the animals, but this is not a basic drawing course, so I don't know what their expectation was. There will always be people who moan and blame others for their inadequacies! I just think this course is great value, and I'm looking forward to the painting bit! When you're so far behind as I am, you have to take shortcuts sometimes. So when I saw the challenge for Week 11, I was delighted - Draw, Photograph or Collage a bird onto your page! I had the perfect candidate waiting for me - a little project I had done in my sketchbook back in January - The Crow - check the link if you want the steps to this really easy transfer method using packing tape! So all that was left to do was to prepare a flap on which I can add my journal diary for next week. I found the Dealz blank postcards very useful for this - they're not too thick, but yet they take paint quite well. 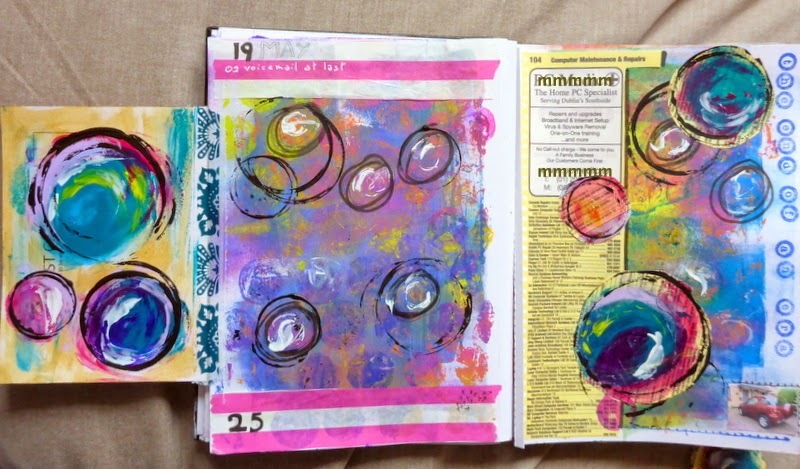 So I made circles - from the blog Me with My Head in the Clouds - very soothing - on one side and applied green paint with a brayer on the other and doodled dots and dates on the other side. A little strip of washi tape to attach it to the page, and I called it done! Week 10 of the Documented Life Project challenges was to make a list of the things that make you you. I used my usual background of acrylic paint applied with my brayer - as you know I hate to waste paint. I applied little photos that describe me and I surrounded them with lots of little marker golden dots. Then I decided that I wanted to keep that page personal, so I added a flap - this time using tissue paper (I still haven't got around to buying deli paper, and I'm a believer in using what I have rather than buying more art supplies). 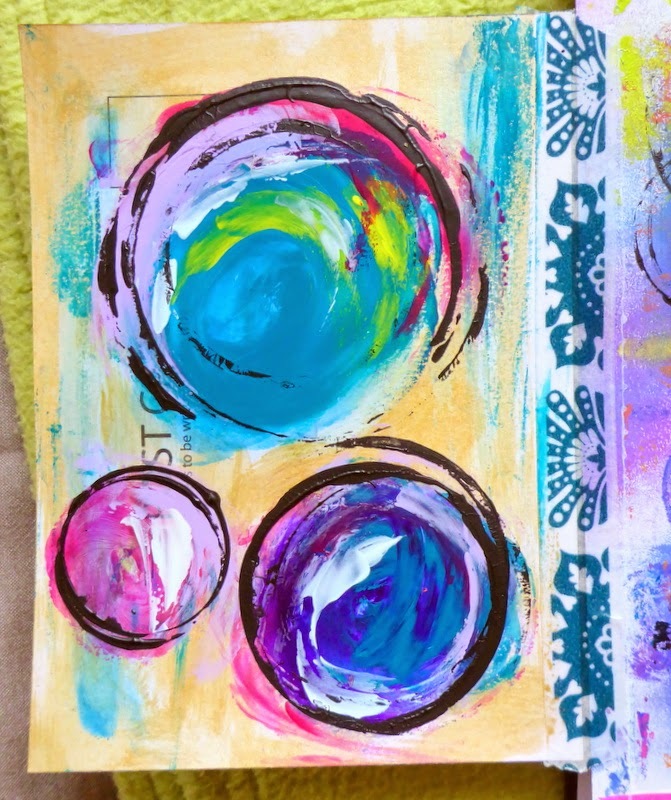 Again I had used that tissue paper to use up the paint left on my brayer after a gelli print. 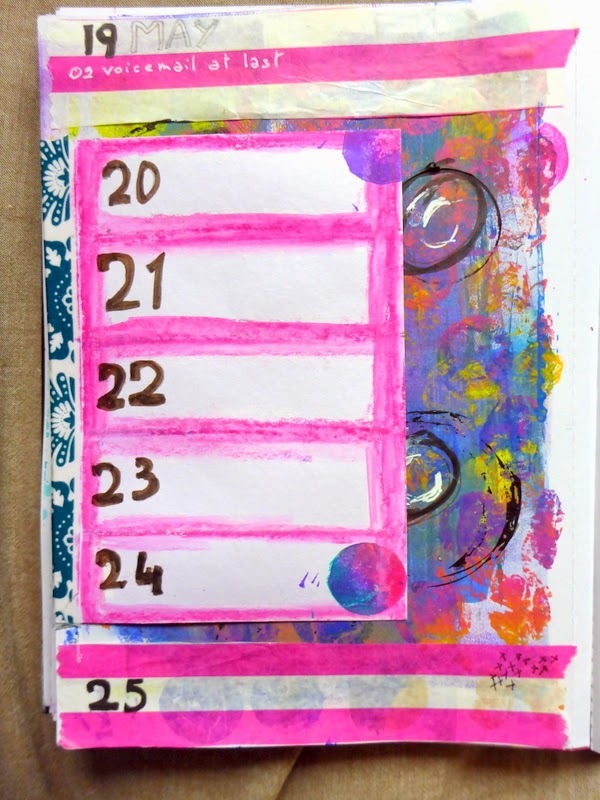 I stamped my initials and also the stamp that I made for Week 6. Week 9 was to use something recycled and collage it - I decided to use a page from the Golden Pages - we always get the new edition in May, and the old one goes into the recycling bin. On the calendar side, I glued a few lines from a cake wrap - beautiful pink and white, all fluffy and yummy. But I liked my bubble-wrap print so much I didn't want to cover it all. So I had to resort to adding a flap to the page - since I've discovered flaps, I can't get enough of them. I used a blank postcard (from a Dealz pack - € 1.49). That's about it (a few doodles here, a few round stamps there, ...). So I called it done. I love it that the ladies from Art to the 5th came up with all these ideas to inspire creativity. So, I've now completed the Week 8 challenge - add a flap to your flap. I was glad of the tutorial video from Roben-Marie Smith, because I was really not sure about the technicalities of this project. I cut my own arrow stamp - not quite so delicate, but pretty all the same. I glued a beautiful Japanese stamp - you can never have too many Japanese stamps! I applied washi tape to fix my flap to the top of the main page - again, thank you to Roben-Marie Smith for excellent video instructions on how to do that! Go to Airfield before these cute little piglets grow up! Cut a round moon from a leftover Gelli print - my Gyro-Cut was giving me trouble despite the new blade, but I managed it in the end - the bottom of my moon is a bit flat! Pencilled in a little bit of light on the horizon (I was inspired by a post on Gelli Arts' facebook page by an artist called Kathleen Pequignot). I used my good old Caran d'Ache pencils - I already had those when I was still getting colouring books for Christmas presents - I do have a tendency to save my beloved art supplies. Somebody calls it hoarding! Then I added my to-do list for the day on the opposite page. Do you get the feeling that you can never complete even half the tasks on your To-Do list? I nearly didn't get to work on this week's challenge - between work and dog, life is busy. So I decided to keep it simple - not so many steps. 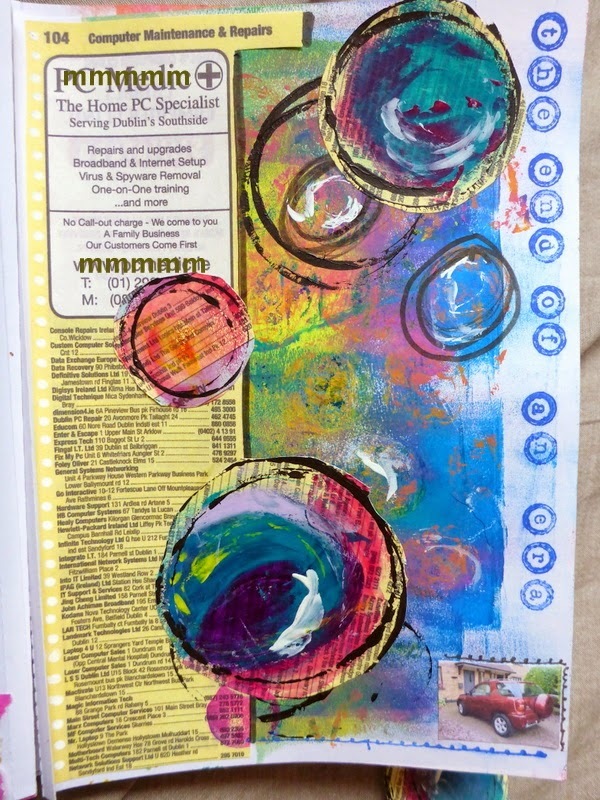 As usual, I picked a page that I had already painted with left-over paint from Gelli printing. 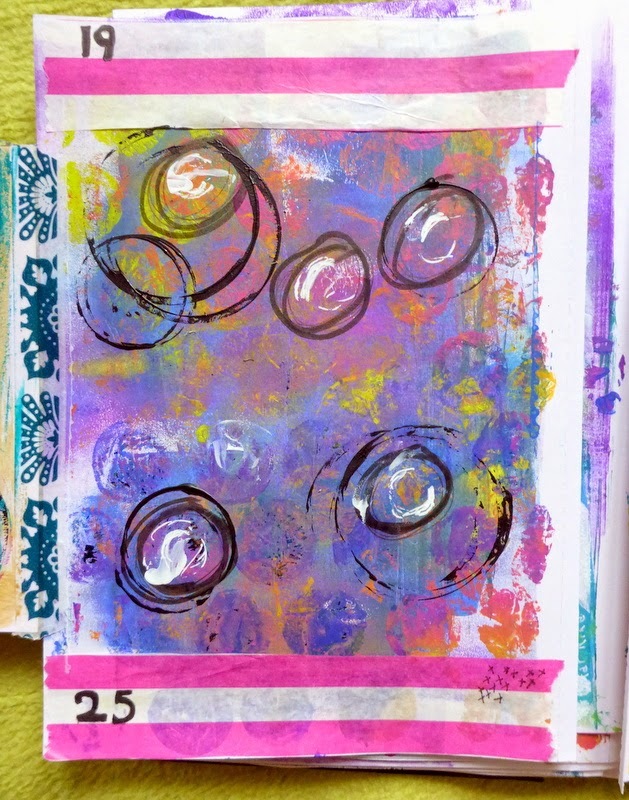 This one has a simple polka-dot theme from a free stencil I received from Gelli Arts when they sent me my Gelli plate, or was it from the UK distributor? I then got to work on my stamp with my carve-a-stamp kit. This is the most intricate stamp I've ever done - yes, I'm a beginner - so I was worried that I might make it too chunky, or, cut through a stalk in my attempt to carve intricate detail. But it all worked out, and I'm rather pleased with the result. If it wasn't for this challenge, I don't think I would have tackled such an intricate stamp. So my thanks go to the ladies from Art to the 5th for their inspiration, or rather for helping me convert inspiration into actual art! Stamped "bank holiday" with a new set of Urban Stamps I got in town last week. I called it done! 11 steps only!